In a surprise development, the Arctic Military Environmental Co-operation (AMEC) grouplong seen as the environmental conscience of US, Norwegian and Russian nuclear dismantlement efforts in Russia, providing safe temporary storage of spent naval nuclear fuelmay no longer include Norway, AMEC representatives from that country said. The situation is apparently undecided as yet, but discussions within AMEC say Norway will end the programme upon the completion of dismantlement of a dilapidated Russian project number 291 November class non-strategic sub, the K-60, ensuring its safe conveyance via a so-called heavy-transport vessel from the semi-operational Russian naval base of Gremikha on the eastern Kola Peninsula to the Polyarny Shipyard in the Murmansk inlet. The project is expected to take place over the summer. Within AMEC, Norway is seeking funds for the transportation of the submarine while the UK is funding another task, the development of pontoons. The transportation of the K-60 is estimated at $3.5m. The UK and Norway both intend to share 50-50 on the subsequent submarine dismantlement, which is estimated at $5m. But Norway maintains the technical lead on the project and is, according to the Norwegian Defence Research Establishment Thor Engøy, technically ready to go in accordance with AMECs best practice policy. The next task is to prepare a detailed transport plan including a risk and environmental impact assessment before the K-60 is hauled from Gremikha in July. But an apparent squabble between Norways Ministry of Foreign Affairs (MoFA), which allocates the funding for the project, and Norways Ministry of Defence (MOD) which will receive the funding and which runs AMEChas apparently surfaced, according to Norwegian AMEC representatives. The delay, said Engøy in an interview with Bellona Web, is threatening the timely execution of the project in the Arctic region. There is an urgency to start work because we have to hit the right weather conditions for navigation in the [Northwest Russian] region, which come mid summer, he said. The whys behind the protracted negotiations between Norways MOD and MoFA, however, are hard to pin down. Some observers have suggested that MoFA wants to hinder the fundingif not withhold it outrightas MoFA wants to dictate Norways nuclear policy in Russia, bringing a political charge to the delay in funding. These observers have also suggested that competition between the MOD and MoFA raise the competitive bar: While AMEC can accomplish highly complicated dismantlement operations, MoFA has so far stuck with easier projects on submarines that are in much better shape. It is therefore a matter of honour for MoFA, which holds the purse strings in any case, to be at the forefront of Norwegian nuclear clean-up efforts in Northwest Russia. Responsible parties at MoFA could not be reached for comment despite several telephone messages left by Bellona Web. She added however that such a decision would be political and taken at a ministerial level. Kroken also maintained that military to military dismantlement projects were running out and that the blossoming number of civilian government to government nuclear clean up projects have made AMEC something of an anachronism in this new landscape. We have been involved in AMEC for 10 years and this is a good milestone for us to evaluate what we have accomplished and what we could accomplish in the future, she said. In the view of the Bellona Foundation and other AMEC watchers, however, Krokens words give short-shrift to the number of Russias nuclear surface vessels that are also languishing in ports, still loaded with spent nuclear fuel (SNF) that are also in dire need of dismantlement. The respective militaries of Russia and Norway have furthermore developed a culture of trust between one another that cannot be easily supplanted by civilian contract work from the West. Bellona and observers therefor feel that AMEC has far from exhausted military to military co-operation with Russia. AMEC was, until the 2003 joining of the UK, a three country consortium created by the respective defence agencies of the United States, Russia and Norway in order to address military-related environmental problems, primarily submarine dismantlement, in the fragile Arctic ecosystem. AMECs underlying philosophy is that it should be easier to discuss military environmental problems through a military co-operative effort than through civilian channels. The programme also emphasised the need to leave behind an infrastructure for Russia to use after US led Co-operative Threat Reduction (CTR) and Norwegian programmes have come to an end. AMECs efforts include a number of specific activities geared toward both nuclear and non-nuclear environmental security concerns in Russia and to complement related projects that are underway in Russia pursuant to the objectives of CTR and Norwegian government policy. The cask, AMEC Project 1.1, is Russias first dual usetransport and storage caskwhile the pad, AMEC Project 1.1-1, reduces the SNF de-fueling from nuclear submarines from 3 months to 3 weeks. example of which was the sinking of the K-159 in August, 2003. 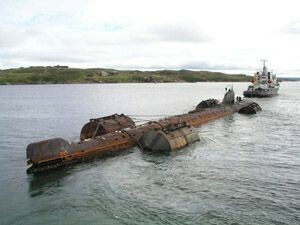 This was a Russian dismantlement programme, and almost no safety precautions were taken to keep the sub afloat, beyond manning it with a crew to clog holes during towing and fitting it with a set of rusty pontoons. Nine of the 10 sailors aboard the K-159 were killed when it sank. In order to avert similar catastrophes, the Norwegian project for the K-60which is absolutely un-seaworthy according to AMEC Norways Engøy will employ a heavy lift vessel to convey the sub to its dismantling point. 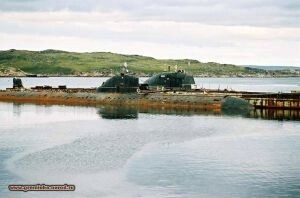 The K-60, by all accounts, represents one of the most dilapidated submarines in the Northern Fleet. Rusted throughout, it cannot be transported on its own hull, even with the support of pontoons. Therefore, according to project director Engøy, it will be transported ina heavy transport vessel. 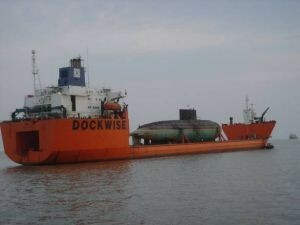 The vessel has been secured by Norway for use from the Dutch firm Dockwise. All that remains is a final detailed environmental impact study so that the western contractors and Russia can put the plan of the vessels removal together. Time is therefore of the essence as the MOD petitions MoFA for funding the project. But Engøy could not speculate as to when he thought the funding would come through. This is a political questionI know only that deciding on the funding is of the essence, he said. NDEP and MNEPRthe obsolesence of AMEC? 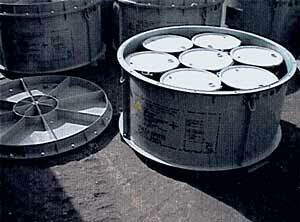 Kroken said that the Northern Dimensions Environmental Partnership (NDEP)a fund for environmental renewal in Northwest Russia held by the European Bank of Reconstruction and Development and burgeoning with more than EUR 160mas well as the 2003 signing of the Multilateral Nuclear Environmental Programme in the Russian Federation (MNEPR) accord , have made bilateral nuclear remediation projects with Russia easier. The number of donor nations now involved and the transfer of responsibility of the nuclear legacy waste from the Russian Navy to Rosatom, may therefore make it harder for some of the AMEC nations to justify expenses, if the nuclear problems can be solved by these means, said Kroken.